Supporting and strengthening high-quality Career Technical Education (CTE) remains a priority for state policymakers, according to a new report from Advance CTE and ACTE. 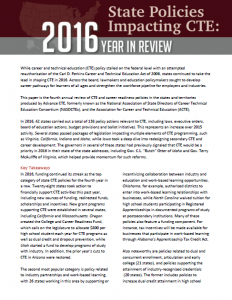 The report, State Policies Impacting CTE: 2016 Year in Review, is the fourth annual policy scan highlighting state activity. Below are some key takeaways from the report. In recent years, both state and national policymakers have demonstrated a growing interest in strengthening career readiness systems through legislation, executive orders, rulemaking, budget provisions and ballot initiatives. In 2016, states continued that trend, completing a total of 139 policy actions across 42 states. This is a slight increase over 2015, when 39 states passed a total of 125 policies. This activity reflects that states are increasingly buying into the notion that alternative pathways such as two-year degrees, apprenticeships and industry-recognized credentials can lead to high-wage, high-demand careers. This is fueled in part by national initiatives such as the New Skills for Youth initiative, Pathways to Prosperity and the National Governors Association’s Talent Pipeline Policy academy, which each aim to catalyze the transformation of career preparation in states. Funding was the leading category of policies passed in 2016, consistent with the past four years. Related policies this year include new grant initiatives such as the Strong Workforce Grant in California, which provides $200 million in noncompetitive funding to strengthen workforce development programs in California community colleges, and Massachusetts’ Workforce Skills Capital Grant Program. Last year also saw the restoration of funding for the Arizona Joint Technical Education Districts after a $29 million cut in 2015. Other extant trends from the past year include policies related to industry partnerships and work-based learning; dual and concurrent enrollment, articulation and early college; and industry-recognized credentials. The Every Student Succeeds Act (ESSA), which reauthorized the Elementary and Secondary Education Act, was signed into law in December, 2015 and includes numerous opportunities for states to accelerate work around CTE and career readiness. While most states spent 2016 engaging various stakeholder groups and developing draft plans to implement the law, some states took initial steps to pass policies in support of implementation. West Virginia and Oklahoma, for example, each adopted accountability systems that recognize and value career preparation. West Virginia’s accountability system includes an indicator that recognizes the percentage of 12th grade CTE concentrators, while Oklahoma adopted a “Postsecondary Opportunity” indicator that includes dual credit coursework, internships, apprenticeships and industry certifications. Several states saw and passed initiatives related to CTE on the November ballot. In Oregon, voters approved Measure 98, which establishes the College and Career Readiness Fund and directs the legislature to allocate $800 per pupil to establish and expand new programs, including CTE. Meanwhile, Arkansas voted to legalize medical marijuana and subject sale of the drug to state and local sales tax. Under the approved amendment, 60 percent of the revenue generated through the sale of medical marijuana will go to support skills development and training. South Dakota voters also approved a measure that directs the legislature to restructure the way the state technical colleges are governed and remove authority from the Board of Regents. 2016 saw growing momentum in support of CTE at the state level, and this year’s activity tees 2017 up to be an important year for CTE and career readiness in the U.S. We anticipate states will continue the work started in 2016 by picking up legislation introduced in 2016, adopting new strategies to implement federal legislation and beginning the work of implementing policies passed in 2016.